We are fortunate to have a great place to hike (or mountain bike) just around the corner from our home in Colorado Springs: Palmer Park. Named for the founder of the city, this place has trails for everyone. The park is surprisingly large despite its location in the center of town. The trails criss-cross every section of the park and can be combined for some really long and challenging hikes. All the trails are well marked and are rated like ski slopes - green trails for beginners, blue for intermediates, and black diamonds for a real workout. 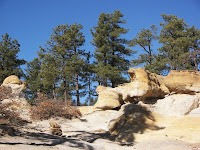 There are lots of rocks, sand, and scrub brush along with winding sections, rock drop offs, and real mountain climbs. 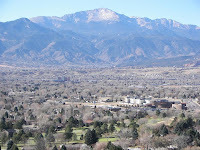 The views of Pikes Peak over-looking the city are spectacular. Trails are well-marked and maintained by volunteers. 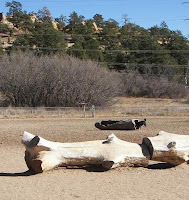 There is a closed in area where dogs can romp and socialize, lots of picnic spots, areas for sports, a well-equiped playground and necessary facilities for the many residents that benefit from the park. 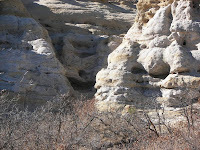 The geological formations are very interesting. Some are estimated to be 60 million years old. 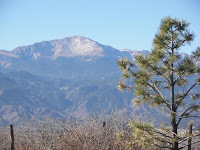 When we are in Colorado Springs, Bill and I like to go hiking in the park a couple of times a week. We still have not been on all of the trails - but we're working on it!